The Borough’s 2018 property tax rate is 5.631 mills. A mill is one one-thousandth of a dollar, and in property tax terms is equal to $1.00 of tax for each $1,000 of assessment. 5.631 mills, therefore, is equal to $5.63 for every $1,000 of assessed value, or $563.10 for a home assessed at $100,000. What other taxes does the Borough assess? A “Per Capita Tax” of $10 per year is paid by all Borough residents 18 or older as of January 1 each year. An “Occupation Tax” of $10 per year is paid by residents who live in the Borough at any time during a given year. Members of the clergy and residents with less than $5,000 total annual income are exempt. An “Earned Income Tax” of .5 % (1/2 of 1 percent) is paid on any income or net profits earned by Borough residents or any income earned in the Borough by non-residents. The Borough also has a “Local Services Tax” of $52 per year which is paid by every taxpayer employed in the Borough. Why does my property tax bill seem much higher than that? The Borough is just one of three entities that assess a Real Estate Tax. In addition to the 5.631 mills pair to the Borough, Borough property owners pay 6.876 mills* to Dauphin County and 22.1500 mills* to the Middletown Area School District (*based on 2014 rates). Who do I contact with questions about my local taxes? The Borough Tax Collector is Pamela Miller. Her mailing address is 131 Oak Hill Drive Middletown, PA 17057. Phone: 944-8336. 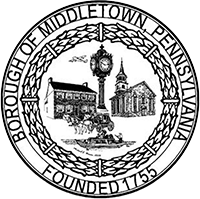 The Middletown Area School District Tax Office can be reached at (717) 948-3300 ext. 1018. You can reach the Dauphin County Tax Collection Bureau by phone at (724) 978-0300. When will I get my utility bill? There are 4 billing cycles in the Borough. Bill dates go by where you live. If you were not told when your bills get mailed when you opened your account, call (717) 902-0706 for the dates. Each person gets two weeks to pay the bill without a penalty. Billing is always for what you have already used. To be sure check the bill for service to and from dates. What if I can’t pay the whole bill? It is best to pay as much of the bill before the due date as possible. Only the unpaid current amount will get a late fee. After the due date, the unpaid amount will be due about three weeks after the original due date. Can my electric be turned off if left unpaid? Yes. The borough has a strict policy for paying bills. If the bill is left unpaid after the final notice date, your account can be terminated until payment is made in full on the account. Is there a charge to restore the power if my electric is terminated due to delinquency? Yes. At this time the charge is $60.00. Please be sure to pay on time to avoid these fees. In addition, the Borough reserves the right to collect a deposit in the amount of $50 on any account that is terminated for nonpayment. After the bill is paid, when will my electric be turned back on? If the payment is in the office before 3:00 p.m., the electric will be restored the same day by 3:30 p.m. If the payment is received after 3:00 p.m. it will not be restored before the next business day. What if my check is returned on an account that was terminated for delinquency? Your electric will be disconnected without further notice until the returned check is paid in full along with a returned check fee. This can be done in the office by paying with a money order or credit card. Why can’t I pay over the phone? At this time, we are not permitted to accept credit card payments over the phone. Payments are accepted in person in the finance office or by credit card on our website. We also have a box for your convenience in the back parking lot. This is collected each business day before 8 a.m. The drop is not collected while we are open. If it is necessary to have a payment in immediately, please bring the payment into the office. Be sure to properly mark any payments made in the drop to be sure we credit the correct account. Regular mail is also a popular method of payment. For your convenience we also have draft payments. This can be set up in the office. What can I use to pay my bill? We accept checks, money order and credit cards. We do not have a payment plan. Each bill is due to be paid in full within the 5 week period as stated above. The budget is a program that takes your last 12 months history and divides the total by 12. You pay that amount for 11 months. The last month is called the square-up month. At that time, you pay the difference of what you were billed with the final budget bill or you will receive a credit, if you overpaid, of that amount on the final budget bill. This program does not save you money. It helps you budget the money that you would be paying into one equal payment. This way you know what you will pay each month in advance. The Borough reserves the right to review the account and makes changes as needed. Please refer any questions on this to the finance office. When I moved in, I put down a deposit. When do I get that back? Borough ordinance requires that each resident have a deposit on file when an account is established. If you have paid your bills on time for 12 consecutive months, the money will be refunded, with interest, on the 13th bill. If you have not paid on time, or you move out before the 12 months occurs, the deposit will be refunded on the final bill. It’s just a fancy word for trash. Every residence in the Borough has trash pick up. What day will my trash and recycling get picked up? The Borough contracts through Penn Waste; www.pennwaste.com provides all the information on what they can take. Trash and Recycling are picked up the same day but by different trucks. For the actual day, contact the Borough office.